Summary: "It all starts with a text: Please, Wylie, I need your help. Wylie hasn’t heard from Cassie in over a week, not since their last fight. But that doesn’t matter. Cassie’s in trouble, so Wylie decides to do what she has done so many times before: save her best friend from herself. In this breakneck tale, New York Times bestselling author Kimberly McCreight brilliantly chronicles a fateful journey that begins with a single decision—and ends up changing everything." This is the first ARC I've accepted since coming back from maternity leave, and, folks, I picked a good one. But maybe not a great one. 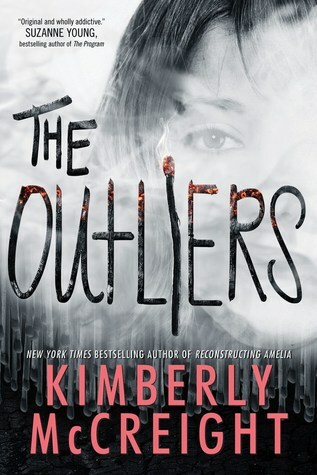 The Outliers is a YA mystery/thriller full of twists that had me gripping my paperback so hard it left marks on the cover. That being said, I read a different blurb than the one above when I first was pitched this book, and the blurb I read gave away a main plot point that isn't actually revealed in the novel until nearly the very end of the book. I was bugged when I realized that I had been spoiled ahead of time on the main, big reveal. Also, that main plot point was the reason I accepted this novel for review. I obviously can't tell you what that plot point is, but suffice it to say, I was expecting a very, very different kind of book from the one I received. 1) It has a fantastically creepy mood to it. The atmosphere is very chilling, and will have you looking over your shoulder and examining your instincts for like a week after reading it. 3) It never lets up. There was no boring middle section. No clunky filler scenes. Everything kept me breathless and on the edge of my seat. 1) Wylie's relationship with her brother. I know not all siblings get along, but this relationship felt weirdly and needlessly antagonistic. This isn't really a problem with the book itself, just my own dissatisfaction with how much animosity was between them, given that it really didn't contribute much to the plot, plus it felt disingenuous considering their family circumstances. 2) The last 20% of the novel gets wacky. Like, crinkle-your-nose-bad wacky. There is a twist that I can't go into detail about without being spoilery. (I'm not referring to the main plot twist I was spoiled about in the blurb I was pitched with, this is a different twist - like I said, lots of twists in this book.) But I can say that I think that twist was too big. I don't say that much around here, but, people, this twist is practically a genre change. It was so jarring that I was more confused and, frankly, a little annoyed that such a big rug got pulled out from under me. It had me reevaluating the whole book, and not in a good way. It's like I had been in the forest, driving recklessly past bobcats and hunters, when suddenly the backdrop switches from forest to... the moon. It's just strange. I said that this book was unpredictable, and that is usually a good thing. But not all surprises are good surprises. And a few of the things that happened in what was meant to be climactic scenes were just flat out weird. 3) ) There is a giant cliffhanger at the end of the book. I'm not necessarily against cliffhangers, but this one just felt like a ploy to make you read the next book. So I clearly had some problems with this story. There are a few things I would have really liked to change. But, in the end, I still had a fun time with it, and thoroughly enjoyed the heart racing moments. There are some issues, but this book still offers a wild and creepy story that will definitely keep your attention and surprise you along the way. Bottom Line: Consider this one if you like the unpredictable! If you can get past a few more convoluted moments in the end, this creepy and breathless thriller is worth its weaknesses. Ha! All your review did was make me want to read it to see what on earth happens. I'm intrigued! Ha! I had a good time reading it, and hope you do too, if you do read it. Be warned, however, that if you do I will be peppering you with dozens of questions because I NEEDS to talk to someone about all those plot twists.